Is your dog jumping on guests? Counter surfing? Not coming when called? Pulling on the leash? Then you are in the right place! What most people desire from their dog at home packed into one group class. Your dog will learn: Wait to be Fed and Wait at the Door, Leave-It, Crating/Confinement, Calmly put equipment on, Come when called, proper kitchen and table manners (no more counter surfing) and more! This class is designed for dogs 12 month and older (or graduates from Puppy or Adolescent Pup class). Students with newly adopted dogs who are new to training or dogs who need to brush up on their manners at home are a great fit for this essential class. Age range: 12 months and older *Dogs should be people and dog friendly. If not, please see Stress City page. Are you ready to take your dog’s skills to the next level? Looking to prepare for training in “the real world”? 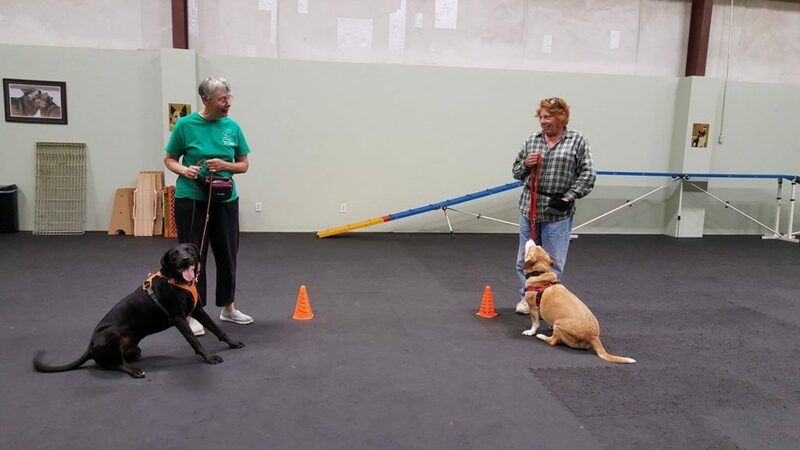 This group class is designed to prepare you for skills needed in the day to day world such as: Loose Leash Walking, Polite Greeting of people and dogs, Wait to exit the car, Leave-it, Come, Mental Connection outside of the class room. While the class will be meeting at our facility in Lawrenceville, it will challenge you with additional distractions before going into “the wild” of the big world. Once ready for the real world you can join us in the Hound on the Town class. This class is appropriate for dogs who have graduated Courteous Canine at Home or the equivalent. *Dogs should be people and dog friendly. If not, please see Stress City page. Does your dog have difficulty controlling himself around food, people, other dogs, or toys? This class is designed to help your dog learn that controlling his impulses pays off! Behaviors covered in this class include: counter surfing, strengthening leave it, ignoring food, working around people, and more! Prerequisites: Puppy, Adolescent Pup, Manners or equivalent. *Dogs should be people and dog friendly. If not, please see Stress City page. Does your dog adore being pet by strangers? Does your dog enjoy visiting new places? Do you enjoy sharing your time with people who need support? Then you may be a great candidate for our Therapy Dog program. In this 6-week class we prepare you for the Therapy Dogs International, Happy Tailsand Pet Partnersassessment. You will fine tune skills like polite greeting, loose leash walking, stay, leave-it, and more! Your dog should be social with people and friendly around new dogs. We will meet with you after registering to ensure this is a good fit for you and your dog. Pre requisites: Completed Adolescent Pup, Manners or equivalent.